Just as with homeowners, businesses sometimes feel the need to expand into the great outdoors. When the Blue Bell Country Club started considering such a move, officers found they had an extra club in the bag with Brian Stover. 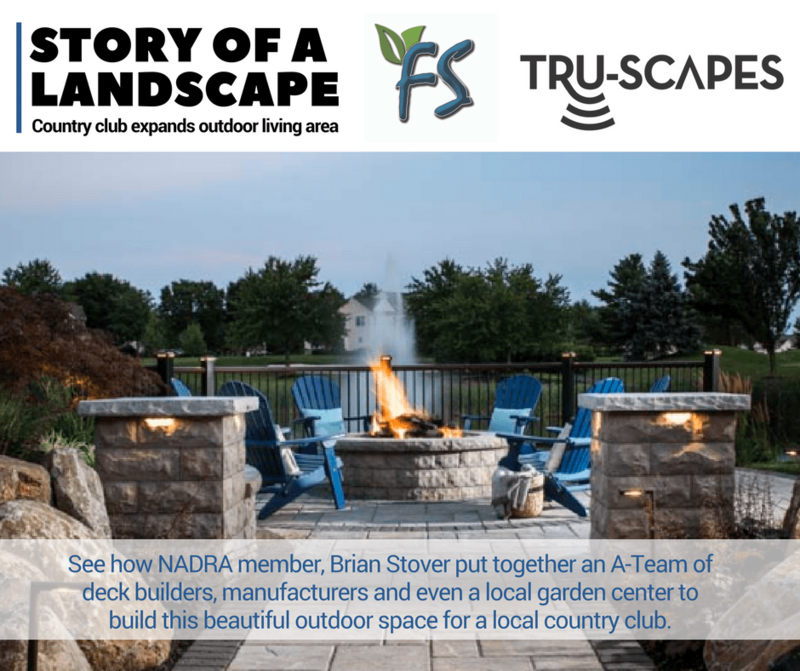 Stover is not only a member, but he’s also a landscape designer and the owner of FS Landscaping Contractors, Inc., and Tru-Scapes Landscape Lighting in nearby Doylestown, Pennsylvania. Stover went with quality over quantity with his design. What he describes as “a stone patio walkway” is only about 300 square feet, but it supports a 36-inch gas-supplied fire pit and features both Adirondack chairs and a seating wall made from Belgard’s Belair wall product. It also carries visitors out to the approximately 120-square-foot Trex deck. Not only is the look attractive, he feels, but because the pond’s embankment falls away at that point, it was the best option to extend the usable area. However, excavating for the project proved to be its biggest challenge. Thanks to the seating wall and the deck extension, Stover estimates the addition can easily accommodate 15 people. Stover’s particularly pleased with the fire pit, and not just because he says working with the Blue Bell team and his own crew enabled them to run just the right amount of gas out to the fire pit to create a great flame. And, to make sure it meets the club’s need to retain late visitors, the project is amply lit by Tru-Scapes Landscape Lighting products, including hardscape wall lights as part of the seating wall, up-lighting for nearby trees, path-lighting along the walkway, and Tru-Scape post cap lights on the deck posts. The project also didn’t stint on the softscape. Where the pond embankment had been disturbed, Stover worked in some boulders, and then planted Purple Verbena to cascade over them. While the newly planted area includes both spring and fall color, he says the greatest emphasis was on summer color because that’s when the country club sees the most visitors. Actual construction of the project took less than three weeks utilizing FS Landscaping crews, but Stover says putting together the team to do the project — and figure out its financing — not only took longer, but was a real learning experience. Stover explains that originally the country club had a smaller budget worked out for the project. The key, he says, turned out to be a good bit of networking. And, the project is a success no matter how you look at it. Not only did it win awards from Hardscape North America and the North American Deck and Rail Association, but it’s achieved the country club’s goal of keeping people there into the evenings. Just receiving compliments from his fellow members and seeing how much they’re enjoying the space is one reason Stover is proud of the project. However, he’s also pleased with how well the job turned out.